BEIT JALLA, West Bank (CNS) — Nicola Sansour’s voice had a tinge of sadness as he recounted how his family planned to celebrate Easter this year. They planned to attend Holy Week services at Beit Jalla’s Annunciation Parish, purchase new clothes for the three small children, decorate eggs and attend the parish Easter egg hunt. His wife, Nivine, 34, would gather with his mother and sisters to make the traditional stuffed semolina “mamoul” Easter cookies. But this would be another year in which he and his family would not be able to celebrate the holiday with a visit to the Church of the Holy Sepulcher — a mere three miles from his home. 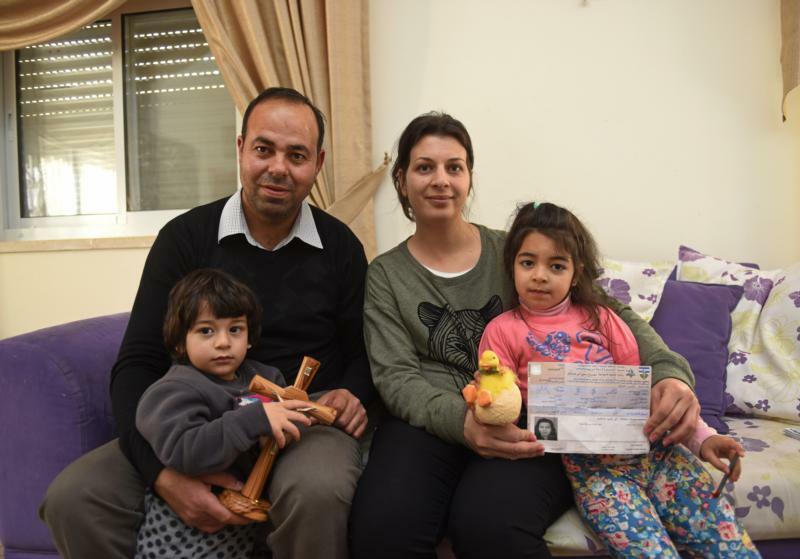 Christian Palestinians need a special Israeli entry permit to enter Jerusalem for the holiday, and Nivine Sansour received the entry permit, but her husband did not. As a university student during the first Palestinian uprising in the late 1980s, Nicola Sansour took part in anti-Israeli demonstrations and was stopped by Israeli soldiers but never arrested. Perhaps, he said, that may be the black spot on his record that prevents him from being giving the permit. But 20 years have passed since then; he has received a university degree and become a teacher. He has sent written appeals to the Israeli Civil Administration but has not received a response as to why they will not issue him a permit. “I am a peaceful person. They never told me (why I can’t get a permit),” he added. Of the 350 families in their parish, some 30 families are in the same situation as they are, Nicola Sansour noted, with the fathers being denied the permit. In addition, 10 unmarried men also did not receive permits. His brother was among those denied a permit. Yusef Daher, executive secretary of the Jerusalem Interchurch Center, earlier said there were many similar cases of some members of Christian families not receiving permits throughout the West Bank, but the exact numbers would not be known until the end of the holiday season. The Latin Patriarchate of Jerusalem website said 847 of the 890 Christian Gazans who had requested permits for the holiday received them, for some — 95 percent of the requests. “The most impressive thing was that the majority of young Christians got the permit. Some of them didn’t leave Gaza since eight years. We praise the Lord for this grace,” Father Mario de Silva, parish priest, was quoted as saying. Israel maintains that the system of permits and checkpoints — including the separation barrier that surrounds Bethlehem and the adjacent villages of Beit Jalla and Beit Sahour — are needed for security reasons following the second intifada, when Palestinian suicide bombers from the West Bank carried out deadly attacks in Israeli cities, many of them in Jerusalem which borders Bethlehem. According to the Israeli Foreign Ministry, some 34 Israelis have been killed in terrorist attacks and 404 people injured, including four Palestinians, in the wave of violence that began last autumn. There have been 331 stabbings and other attacks and attempted attacks, according to their statistics. According to Defense for Children International, some 180 Palestinians were killed and more than 15,000 injured from September through February. Some of the injured and killed included attackers. Last year, Nicola Sansour received a permit to travel to Jerusalem for Christmas, but Nivine Sansour’s permit got lost in the bureaucracy, and she could not go. Nicola Sansour went alone and spent the day meandering around the streets of the Old City before he returned home. But it was lonely without his family, he said. Catholic Philly Readers should be reminded: The Sansour family, like all Palestinian families, are prisoners in their own country. Foreign invaders have taken over their land and made the non-Jewish natives powerless. American Christians should stand with their Christian brothers and sisters against the racist Israeli regime. The injustice, the sin, of the partition of Palestine has gone on too long. Thank you for sharing this story. I just returned from Palestine, and met many wonderful people. Israeli apartheid is truly a human rights crime.